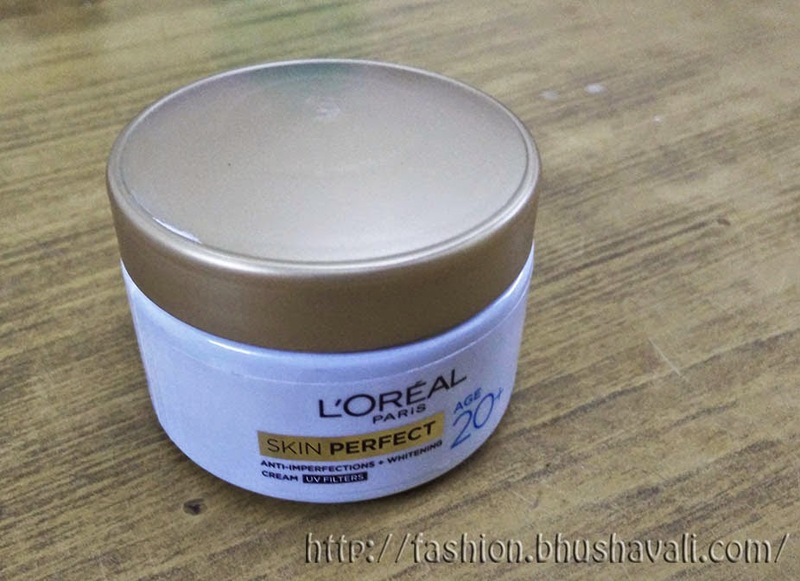 You saw my earlier post on the intro the L'Oreal Paris Skin Perfect Creams for 20s, 30s and 40s. Well, I've been using the 20s version of the cream for about 3 weeks now and here's what I think of it. In the 20s, as you start with your first job and work stress, it shows on your health, face, hair, everything!!! How nice was it to be in school and college days!!!! 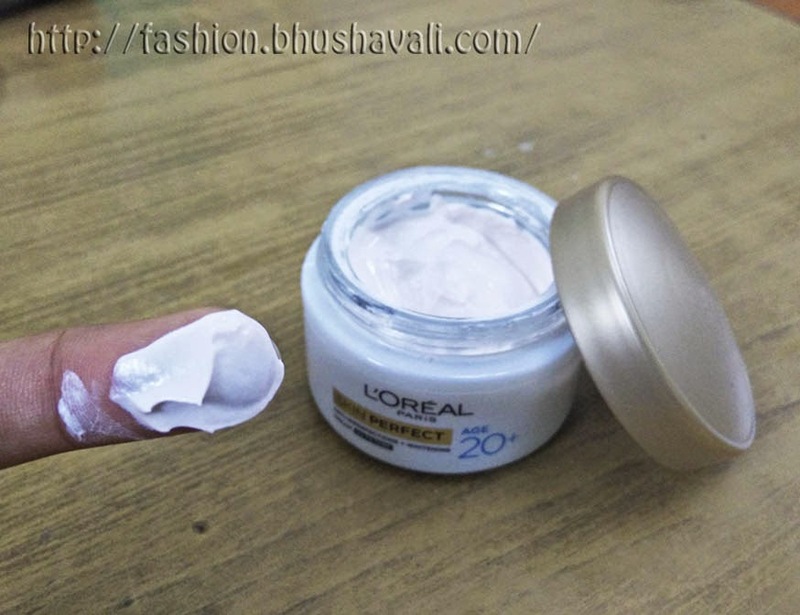 Well, L'Oreal Paris Skin Perfect cream for 20s is meant to tackle that. The 20s cream is supposed to work on Advanced Skin Whitening and Anti Imperfection. 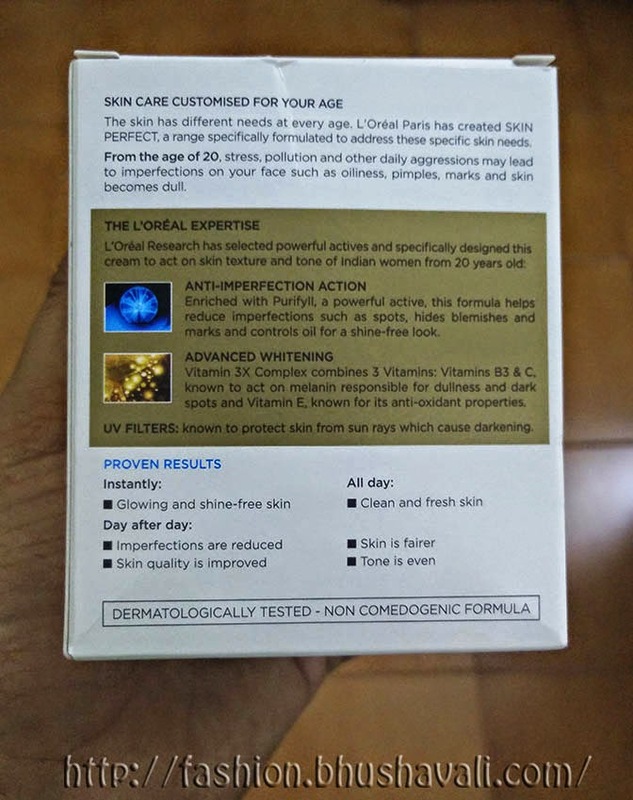 Purifyll works on the imperfections like blemishes, spots, dark circles etc while Vitamin B3, C together work on melanin and Vitamin E works as an anti-oxidant. It claims to have UV Filters however doesn't say how much SPF or PA are present. Its a slightly pinkish cream in a glass tub. The package is heavy, but has a secure screw lid making it spill-free. Its a heavy cream (which the presence of talc creates) with a slight, pleasant, floral talc-y smell. The consistency and smell remind me of the Ponds White Beauty Cream. Its thick, but doesn't leave a white cast. A bit effort is needed in blending it into the skin. Its doesn't moisturize the skin. So, a bit more quantity is needed per application. If you have a combination skin or dry skin its better to apply a serum or moisturizer beneath it. However for oily skin, this would be perfect. It absorbs the oils and leaves a soft, matte skin. I find it perfect to be used as a makeup base, rather than for everyday use. It actually covers up the dark circles and fills fine lines to some extent, making the face matt-er and softer for makeup application, as soon as you apply it. Sometimes when I'm just going somewhere nearby, where I don't bother to wear a makeup, I just apply this with kajal & lipbalm and I'm good to go. It leaves the skin matte and bright for the next couple hours!!! It has not worked on my pimples or pimple marks. My skin is super sensitive and I've had some breakout. I dunno if its coz of this cream of something else. Got to wait and find out. Glad you liked the review!!! Thanks for your comments!! !